It is okay if a book isn’t mind-blowing or life changing and just tells a story as long as it is well written and engrossing. 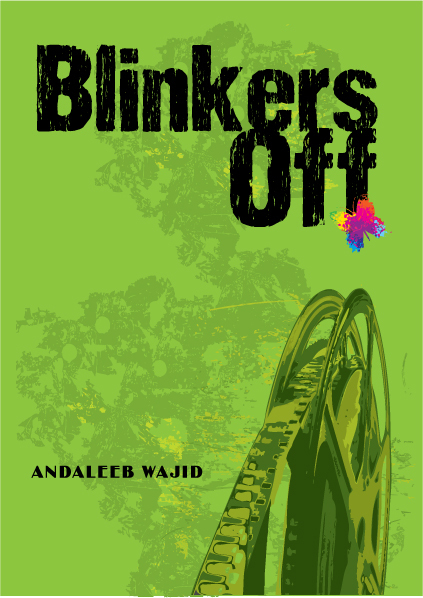 Blinkers off may not make you forget everything else around you and transport you to another fantastic world, but it does entertain and is a fun book. Any well written book has elements that represent reality without making you feel it is real. The trick is to knit a story with the right characters, information and narrate it in an engaging manner. Andaleeb manages this with enough thrill in it to ensure you don’t want to keep the book down! You can relate to the characters and understand their sentiments. There is no exaggeration, albeit the story having the potential to have enough fake Yankee accent to put your US-return aunt to shame. The author keeps it simple and tells us a story without any pretense or airs. The book is about a girl who decides she wants to become a writer a screenplay writer no less. It is her first step into that world, we get to see she joins the film classes in her college. Noor, soon becomes quite a favorite. Though being from a ‘traditional’ family, she learns how to use the freedom she has been given in the right manner. She becomes a better person, from that girl who everyone seems to ignore to a person who has the confidence to step up and take on the world. There are enough stereotypes in the book to have made it drab, yet Andaleeb goes beyond using them as mere tropes and brings them to life. A past paced, quick and thrilling read. Simple and elegant. I wouldn’t mind seeing what Noor does after this, in fact I am curious! The details they hit you, they tickle you and they mesmerize you. The book is like that statue which holds your breath and makes you forget yourself. Yet there is something lacking- the warmth, that which makes you curl up in your bed and forget everything else, except the tranquilizing world of the book. The problem is with expectations, Ghosh to me is not merely an author- he is a writer, he is a storyteller; He is that boy, that uncle, that aged R who you love to listen to. One can’t but help being lost in the pidgin speaking world of Canton. The Pearl River, the avant-garde paintings and the opium all seem to spin around the ball room, pulling us, swaying us. We are at his mercy- we want more, it does not matter what awaits us, yet just when we think we are about to be hung or lost in ecstatic love, we are shoved rashly into a different world. Familiarity breeds contempt- if only I hadn’t read Calcutta Chromosome, The Glass Palace, The Hungry Tide and The Shadow Lines(currently reading). The book takes us across oceans, rivers, cultures, people, love it has it all. The trilogy is no doubt is an adventure like never before yet none is there to haunt me like Laakhan, make my heart beat faster like Ila and Piya or make me wonder what Tribid would say. Each character is so fit for his part that I am left wanting that imperfection that makes him human and brings him alive. The character who for me is trademark Ghosh is Paulette aka Puggly. She is quirk, beautiful and smart. If only we could have had more of her. The artist Robert Chinnery and his letters while being a very clever way to give a different perspective, do seem to yearn the secret ingredient and at a couple of places had me longing for more of Bahram Modi. Neel, the erstwhile ruler turns into a Munshi and is a man of his own. Nowhere do you find evidence of a fall in station; The time spent locked in a cell seems to have sucked away the royalty and yet he maintains a poise which speaks of his breeding. Bahram Modi, his employer, paces him room, brilliantly dressed and imposing with Chi Mei, always lingering, haunting and comforting him. The characters make the story. Considering the amount of intricate detailing and the gargantuan information thrown in, the book is inspired. It is amazing how he manages to make us sympathize and hate the same person- to narrate and to be unbiased is restraint which is worth admiring. 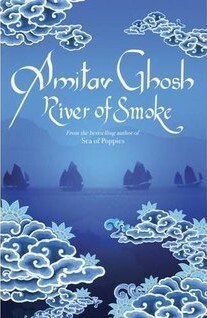 The book engages and presents a city like none other where men stride across a maidan and smuggle opium in boats. The author enunciates the sing-song language used to trade in Canton and recreates a melting pot like none other. The city with the awe-inspiring Commissioner Lin, who takes it upon himself to try to end the opium trade, its friendly locals, stuck up Englishmen, Indians and people from around the world, is an enchantment, painted in Chinnery’s grotesque ways. The book is a must read. Especially if you have read The Sea Of Poppies. I have refrained from talking about the story, simply because it isn’t about what happens, but who make it happen. But, there is a part of me, that wishes he wrote like how he did before. It feels like my favorite teacher has become the school principal. Brilliant, thought provoking, entertaining, awesome, well executed and mind-blowing stuff! The book is about ‘ The Liar’ and his compulsive obsession to lie. It does take you a while to understand the book- at times it seems disjoint and unrelated, but as you grow into it, a ragged sense appears. Last minute call from friends and I found myself in Sathyam, on a leather chair, having paid 30Rs. for parking, rushed through the traffic, dressed up hurriedly-was it worth all this? …..Yes, the movie is awesome! Well rhetoric is an Indian right. Exaggeration and stories are the India intelligentsia’s right. Coming up with absurd ideas and becoming a best-seller is a well a best-sellers right? 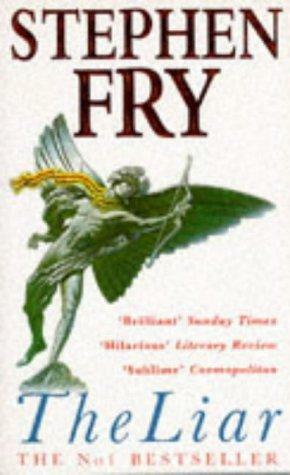 An enjoyable book. How screwed can you think anyway? His English is good- at least that’s a concession in my case, for reading the book, after all English is supposedly dead. The previous post, had a few shades of his style I guess(without the undesirable parts, I guess ). History redefined. The book talks about Saleem who is born on the stroke of midnight. It is an autobiography of the character, who tells his weird and pathetic and messed up(add many other negative adjective you want) life. I can’t reveal the story as such, for even the glimpses of it, might rob this sight of it’s universal rating. The book can have other impacts as well, like it can drive you crazy. You might wonder what’s happening in the world around you. This is the second book of his I read and the more I read, the more I am convinced that trash sells(er..a certain Bhagat comes to my mind, but at least that fellow writes small books and stops with being a racist). The ideas are amazing and almost Satanic in certain ways. See I am in two minds, whether to trash the trash or say that the (almost) empty perfume bottle in it, gives out a good smell to it. This doesn’t even seem like a review. But what do you expect to write? And yes, there aren’t many around, you have read his books, my advice to you people- if you like nonsense and absurd, exaggerated(there is some truth in between it all) and the like, read it. You are currently browsing entries tagged with reviews at the light shines the brightest.